1.1 What is an archive? This guide explains all about 7-Zip: why you need it, where to get it, how to install it, and how to use it. 7-Zip is a program that will allow you extract from archive files. It can also create archive files, which is useful if you want to share stuff you've made on MTS in future. 7-Zip is completely safe to use and is totally free, forever. MTS recommends 7-Zip because it is an easy to use program, and because we know it won't harm your computer or ask you for money. 7-Zip works with pretty much all Windows operating systems, including XP, Vista, and Windows 7. Get 7-Zip from: www.7-zip.org - that is the official site for 7-Zip. While it can be gotten elsewhere, those will be the latest updated files, and they are safe (no viruses!). 7-Zip comes in two versions: an .exe version for 32 bit operating systems, and an .msi version, for 64 bit operating systems. You need to download the correct version for your system. Click on the System icon. You'll get a window that has "View basic information about your computer" at the top. Look in the list under the "System" heading. Look next to "System type:" - it will say either "32-bit Operating System" or "64-bit Operating System" there. Then you just download whichever is the appropriate version for your OS: either the 32 or 64 bit version. Save it to your computer somewhere you can find it - your computer's Desktop is easy enough. To install 7-Zip, double-click on the .exe or .msi file you downloaded. You'll get a standard install program. 32-Bit OS: Just click Next through the prompts to install with the default settings. Click Finish on the last prompt, and 7-Zip will be installed. Just to be safe, reboot your computer to make sure all the changes take effect. After 7-Zip is fully installed, you should be able to download any .zip, .rar, or .7z file normally - just click the Download link from MTS or elsewhere, save it somewhere easy to find on your computer (like a folder on your Desktop) and wait until it's finished downloading. 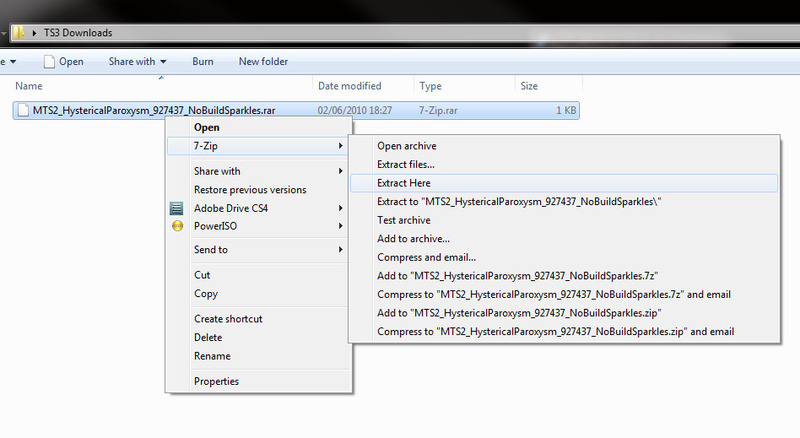 Then, you can right-click on the file to extract it directly to that folder - right-click, 7-Zip > Extract Here. You will see the new files appear in that folder alongside the .zip, .rar, or .7z archive they were contained in. If you have multiple archive files (even of different types) you can select all of them, right-click, 7-Zip > Extract Here. The original .zip, .rar, or .7z file can be deleted - all you need are the extracted files, not the original archive(s). This page was last modified on 3 June 2010, at 04:57. This page has been accessed 168,738 times.